A brand new store in Selly Oak, Birmingham. New bar in the heart of Belfast City Airport, for HMS host. Next generation store design in Sydney, Australia. 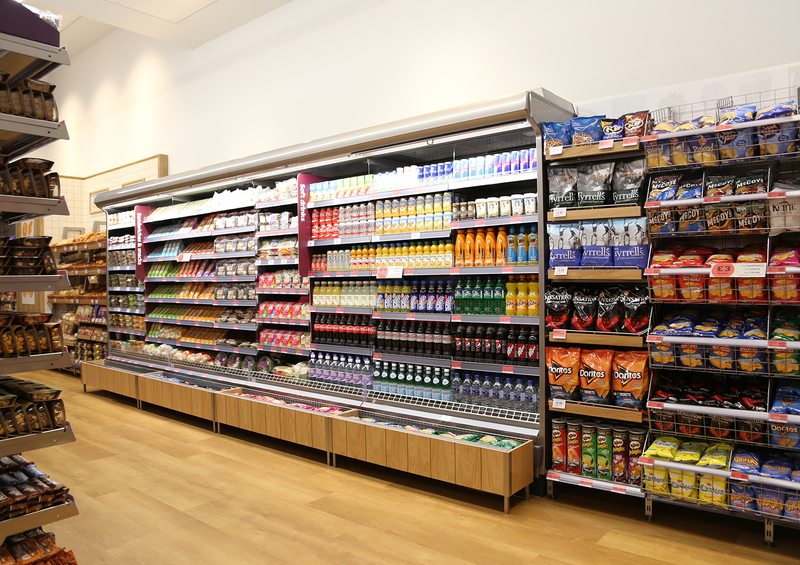 New takeaway and fresh food focused store in the heart of London. Branding and environmental design for an exhibition showcasing propaganda. Brand refresh and website design for a specialist investment business. Brand identity and way finding system for Bicester Village. Brand refresh and shop design for an ambitious brand looking to expand their offer. Assorted press releases and literature to promote the brands latest products. Playful identity and collateral to celebrate our 5th birthday. New branding and guidelines for Boots’ Mother & Baby department. A large format brand book to present and promote SSP’s credentials. New luxury champagne bar concept for Dublin’s Terminal 2 airport. Brand creation and e-commerce website for an online start up skincare retailer. Various creative projects including store design and events branding. Brand and interior refresh for this popular food and beverage offer at Manchester Airport. Waterstone’s seasonal and promotional campaigns for the UK’s biggest book retailer. Promotional brand and product presentation pack for global lighting manufacturer. Redesign of all brand collateral following a business merger with a chain of gyms. Brand development and store design for a German health and wellbeing retailer. Brand communications for a Pan-Asian restaurant chain. Brand identity and store design refresh for one of the countries leading electronic retailers. Design for ongoing trend publications, promoting the most suitable products for achieving ‘the look’. Brand and collateral design for a promotional ‘Survival Kit’ to increase press awareness at London Fashion Week. An inspirational notebook and events calendar designed to help young stylists at the beginning of their careers. and trends at the forefront of fashion. New Mexican takeaway food concept rolled out across rail stations nationwide. A new airside food and drinks offer for Manchester Airport’s Terminal 1. Brand creation and environmental design for an Asian fast food concept. A new, takeaway sandwich concept focused on a simple offer at a great price. Brand evolution of this well established takeaway food and drinks offer. A new eatery for Leeds Bradford International airport. New brand and store concept for a Japanese inspired food retailer. New store concept to help deliver the Dutch supermarket retailers ‘XL’ proposition. The latest in a series of next generation supermarkets for Woolworths. A very Merry Christmas and best wishes for 2018 from all of us here at Twelve. A new food and drink offer for Skavsta Airport in Stockholm. Brand and environmental refresh of London’s famous pharmacy on Wigmore Street. A detailed look at our ongoing work for one of the UK’s oldest supermarket brands. Environmental branding for a US Pharmaceuticals business expanding into the UK. Website design and build for a multi-disciplinary beauty focused PR company. Brand creation and environmental design for a contemporary bar and restaurant in the heart of Manchester airport’s bustling Terminal 3. 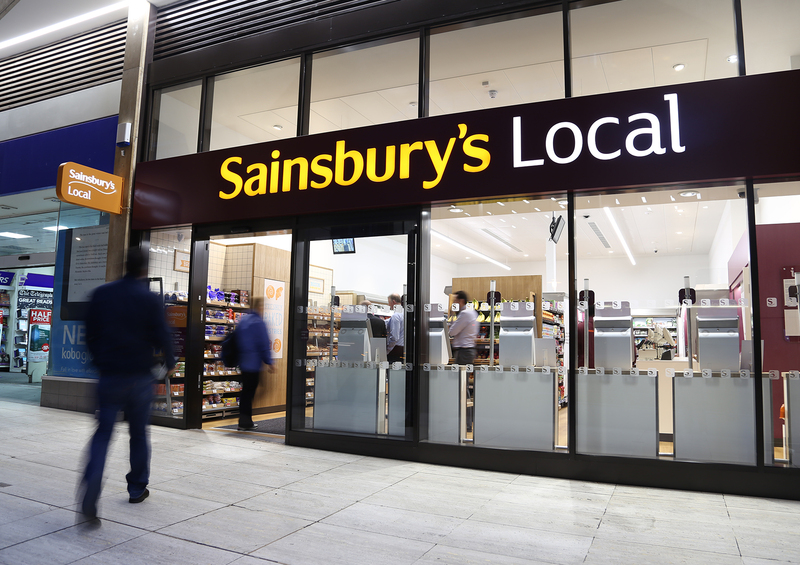 Sainsbury's London flagship with integrated Argos and Habitat offer. Brand development for Travis Perkin’s own bathroom and sanitary product range. A series of themed events to engage and educate staff on building customer relationships and increasing sales. Pilot stores for European pharmacy chain. The creation of a new brand platform and assets for a Norfolk-based food retailer. The creation of three new offers for this family-focused leisure destination. The Vlijtseweg store celebrates the latest iteration of the ‘fresh market’ concept. A new look and feel for DekaMarkt's large format concept store. New branding and proposition for Deka’s convenience offer. Award-winning brand and store design for a German cookware business. Environment and communications development for a popular German DIY chain. New store concept for this much loved British pottery and gifting brand. A showcase of our work for ‘The Food Travel Experts’. Reinventing the conference to breath new life into Travis Perkin’s annual staff event. New bar and restaurant concept for Dublin’s new Terminal 2 airport. A closer look at the work we have done for this family-owned Dutch supermarket. Brand identity and communications for fresh new food market offer. 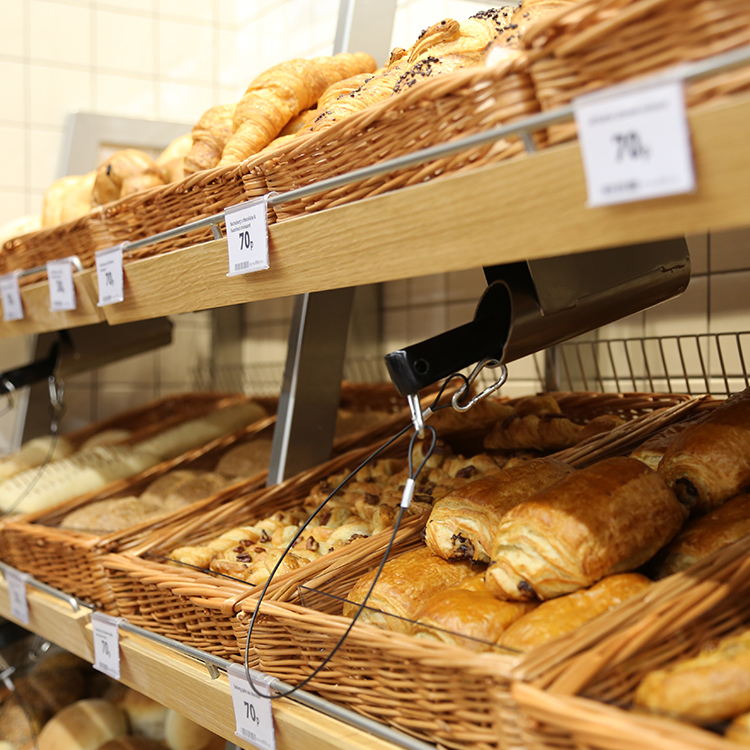 A new store design creating a more engaging and inspiring experience for customers. Identity and collateral for an own-brand range of kitchens by Homebase. New brand, proposition and store concept for Malaysia’s first kitchen showroom. Inspirational brand room design to help educate and engage staff on Travis Perkin’s own-brand bathroom products. A selection of projects recently completed for one of the UK's FTSE100 businesses. Concept store design for the main DekaMarkt estate. A look at some of the early in-store communications work we produced for DekaMarkt. A selection of our favourite projects for one of the world’s leading beauty brands. A series of beautifully designed look books promoting the Hair Meet Wardrobe philosophy. In store branding and product display promoting L’Oréal Professionnel’s expertise in hair styling. Showcasing three recent projects that demonstrate our diverse approach to print. New miniature store design concept, meeting the needs of todays shoppers. 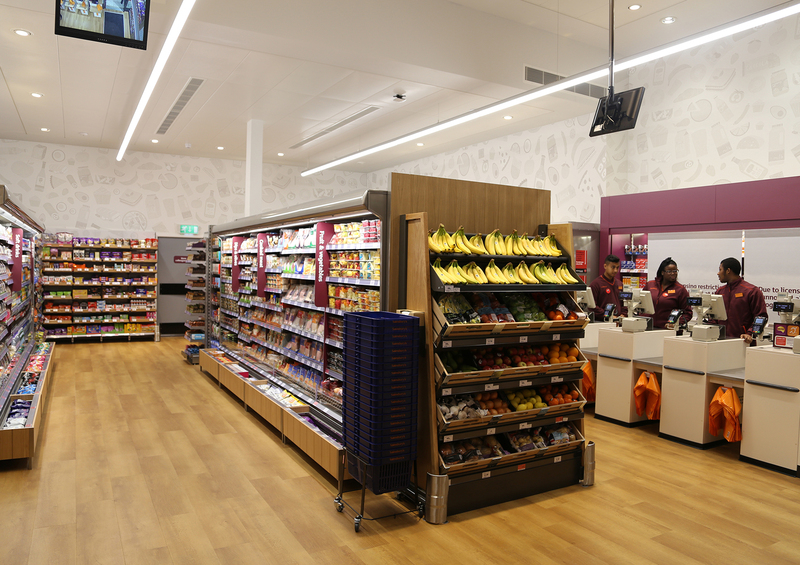 An overview of recent store design projects for Sainsbury’s larger format sites. A selection of notable stores designed prior to the Future Formats initiative. 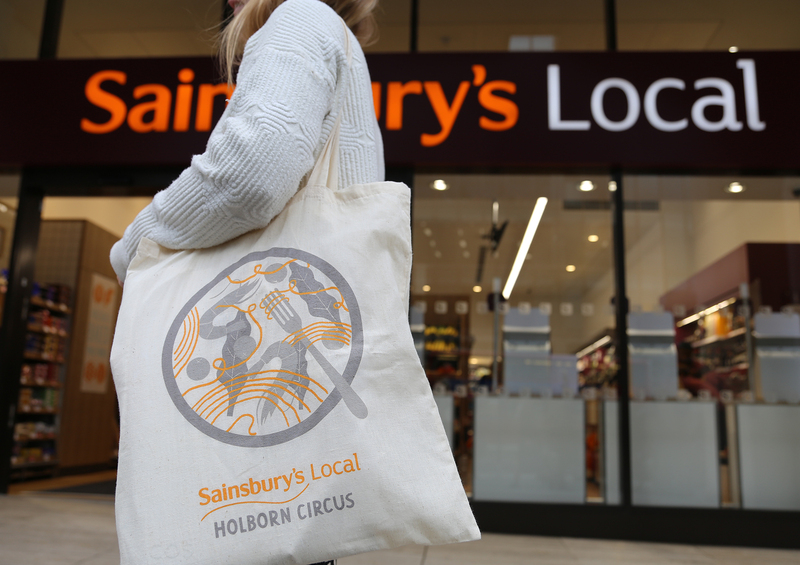 We were given the opportunity to inject more personality into the Sainsbury’s brand. Celebrating local stories and creating a sense of place for customers. 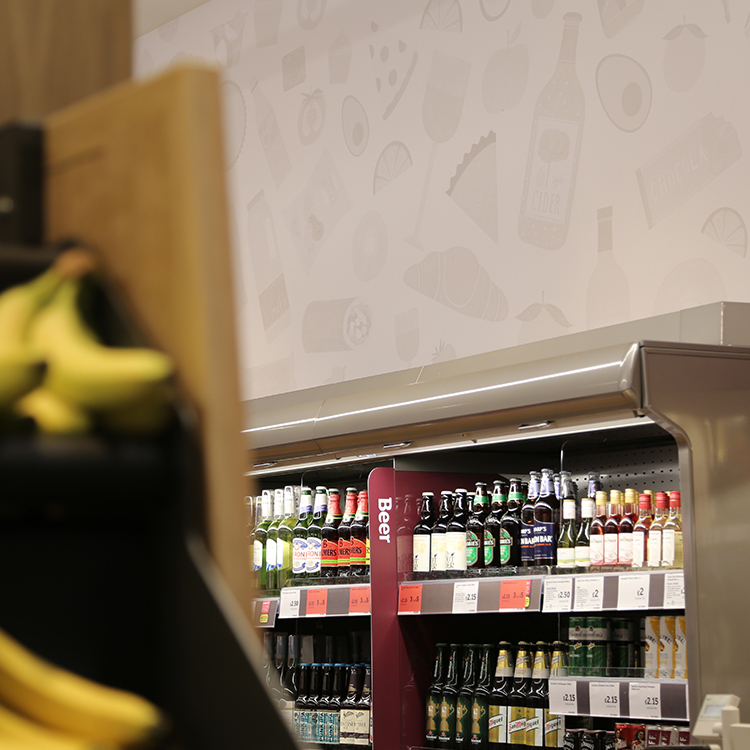 A selection of our work for Sainsbury’s smaller format convenience and ‘super fresh’ stores. Brand creation and store design for a new takeaway fresh food concept. This tiny but perfectly formed store is designed around three specific shopping missions – breakfast, lunch and food for the evening. The range is edited, with the emphasis on fresh and quality produce, and tills at the front of the store provide quick card only paymemt. This store addresses the needs of the increasingly time-poor customers who need to top up at the most appropriate locations.